R2i Millwork Casing - Prefinished Ready to Install - Fauxwood White - 2-3/4 In. x 5/8 In. x 8 Ft.
Transform your rooms without having to paint. DecoSmart makes it possible with a collection of high quality mouldings to create inspiring dicor straight out of the pages of a magazine. Time-saving DecoSmart mouldings are already painted for you with a baked-on coating, which means they are ready to install and be instantly enjoyed. This coating allows for repainting whenever the mood strikes. With DecoSmart you get more out of your mouldings with less time and less money spent. DecoSmart is the smart choice for busy people. 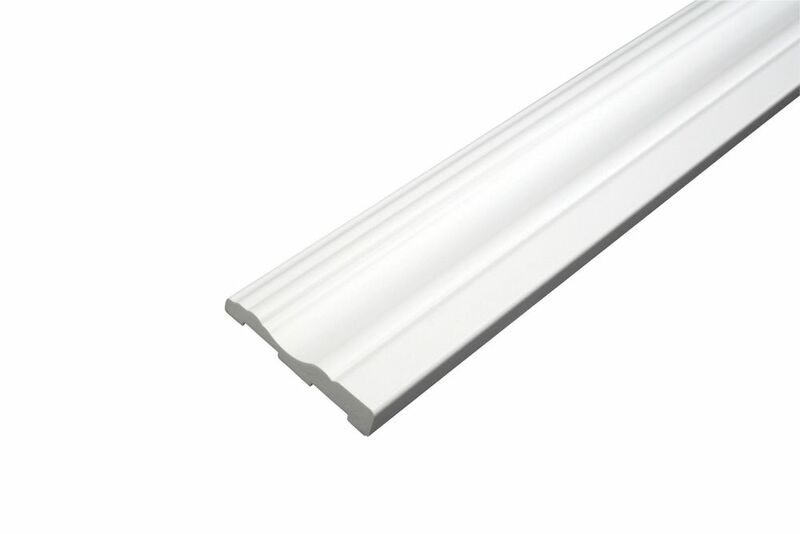 Alexandria Moulding Painted Fibreboard Decosmart Colonial Casing 5/8 In. x 2-3/4 In. x 12 Ft.
Bring your walls to life in a timeless and classic motif. Create a tiered level of design opportunities and possibilities by applying your chair railing 1/3 of the way up a wall, parallel to the baseboards, to prevent chairs from marking the walls. Tap your imagination and let your creativity flow into the room! Casing - Prefinished Ready to Install - Fauxwood White - 2-3/4 In. x 5/8 In. x 8 Ft. Imagine transforming your room without painting! R2i "Ready 2 install" moulding technology gives you a durable professional finish is a time saver and It won't mark and dent like MDF Fiberboard. Bring your room to life! Remodel in hours and instantly enjoy with our pre-finished and ready to Install mouldings. Casing - Prefinished Ready to Install - Fauxwood White - 2-3/4 In. x 5/8 In. x 8 Ft. is rated 4.8 out of 5 by 4. Rated 5 out of 5 by WhiteGhost from Amazing product! Bought this for a couple door casings in room I renovated , very durable product compared to mdf. I highly recommend this if your standards are set high for durability. Rated 5 out of 5 by Lucco from EASY TO CUT AND FINISH Bought this online,delivery was two or three days,looks amazing around my bathroom mirror and matches all the other vinol trim i installed in bathroom,no painting. Rated 5 out of 5 by B bop from Excellent product We bought these because we didn't want to have to paint baseboards for our new house. They worked out great. Look amazing and are easy to use. We used white in the suite downstairs and brown along the bottom of our cedar walls upstairs. Love these.